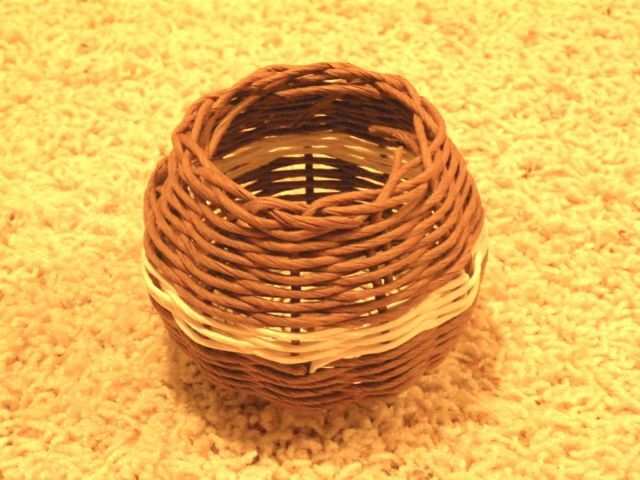 I have been making baskets for about five years, and I still think of myself as a beginner. It’s not that I haven’t made some nice baskets or that I lack the basic skills. I take a lot of basket making workshops, and for the most part, I am pleased with the results (with a few disastrous exceptions). It’s just that I lack confidence as a basket maker. Each time I start a new basket, I feel challenged. I wonder if I can really do it, let alone do it well. This is part of my basic nature in starting new things. I’m always wanting to try new things, but then all my insecurities and fears keep cropping up. And then there is the issue of creativity. 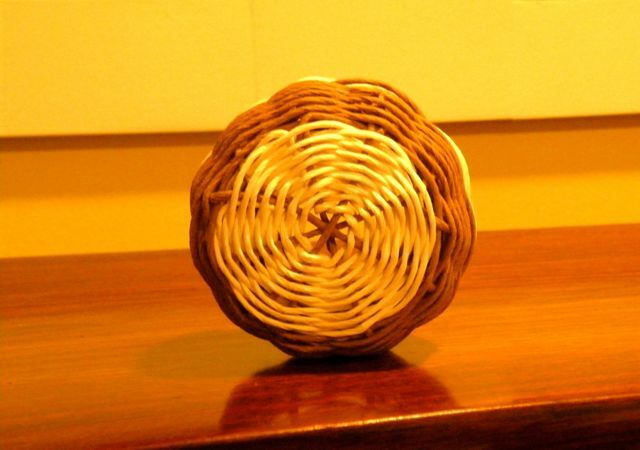 I so want to be a creative basket maker, not just a technician. To bring the element of art into it. I keep feeling that I am close to doing something unique, but then it eludes me. It doesn’t come out right or it’s just not good enough. So when I sat down yesterday afternoon to try to figure out a project to teach at the San Juan County Fair this year, I was not feeling very sure of myself. So imagine my surprise when this cute little basket emerged. There is nothing really difficult about it. It is designed to be taught in an hour to someone who has never made a basket before. But I made up the pattern. I decided how many spokes to use, to twine the base and use white fiber rush for it, to add a spoke so that the sides could be a continuous weave, and to make a stripe halfway up the side. It is a cute little basket. Art it is not. But it feels like my basket. It was a nice moment. And it feels like a step in the right direction. This entry was posted by susanbradfordart. It ‘s quite beautiful. She’s being modest.